Like many other collectors, when Upper Deck e-Pack™ was first launched, I was a little skeptical. 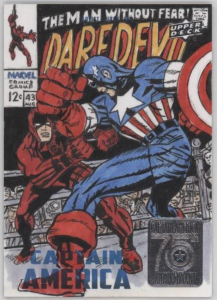 After all, previous attempts by the card industry to leverage the digital channel have been fairly mediocre, even though there have been pockets of fans that have embraced these “digital trading cards.” I personally fall in the rather large camp that wants any digital experience to still fulfill my traditional collecting needs of having physical cards that aren’t considered gimmicky, and therefore have the same collector value that offline sets and singles have. Thanks to the Connor McDavid and #CollectConnor craze I decided to jump into 2015-16 Upper Deck NHL® Series One on Upper Deck e-Pack having failed to secure a McDavid Young Gun in my boxes at my local card shop. 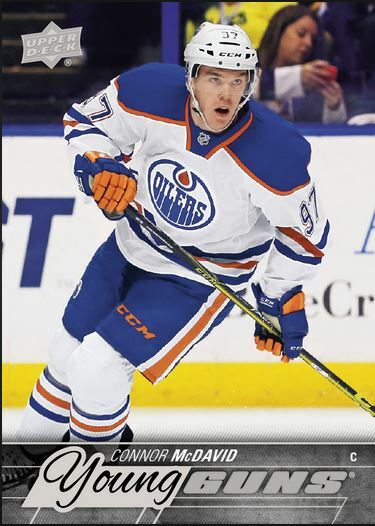 I can’t quite remember if it took me one, or two, or even three boxes to finally hit one, but after hitting the elusive McDavid rookie card #201, I was hooked. I had also been lucky enough to pull a Bobby Orr autograph and a couple of rare inserts along the way as well. I could transfer cards seamlessly to COMC for either resale, or use COMC’s grading service (which I did to ultimately turn several of my Connor McDavid Young Guns to graded BGS 9.5 copies). I could redeem cards for Achievement cards. The most notable was the ability to exchange any 5 of a particular Young Gun for a foil version of the same card. This created some excitement on message boards as it was expected that each foil Young Gun could ultimately be limited from anywhere from 50-150 copies. Remember that VALUE is essential to me in any part of collecting. Finally, I could also trade cards with other collectors. I honestly can’t remember the last time I actually traded cards with a collector before e-Pack. Buying and selling cards online has become so easy that let’s face it, people don’t trade much anymore. Well, a few e-Pack releases later and I am having more fun collecting than I have in a long, long time. I’m still a collector that likes to put together complete sets from time to time and for that, e-Pack has been simply amazing. And because the e-Pack site features a messaging and trading platform that makes it easy to search through other users’ collections and propose trades, no card seems unattainable. Did I mention value? This is where Upper Deck continues to push the envelope with the Achievement cards. 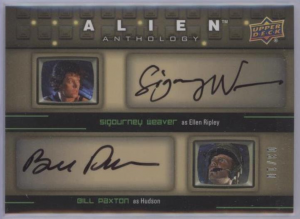 One of my favorite experiences on the site so far was with their release of Alien Anthology™, a set of cards Upper Deck released featuring content from the four Alien™ movies that I grew up on. 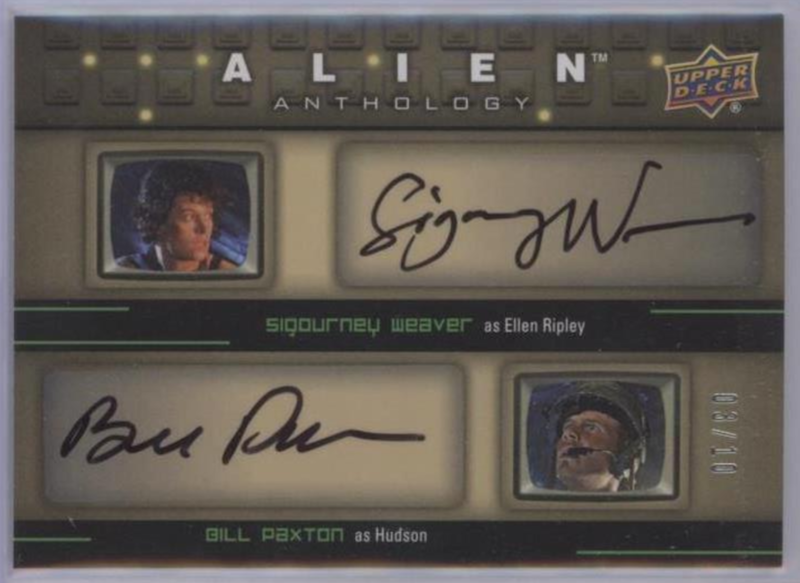 Upper Deck posted an opportunity to “win” one of ten Quad Autographed cards featuring actors from each of the movies (Sigourney Weaver, Bill Paxton, Charles Dutton and Ron Perlman). Getting to the finished line meant acquiring nearly 10,000 cards that would have to first be upgraded for lower level Achievements. To put things in perspective, a case would yield about 1,000 cards. This seemed impossible at first, but it was amazing finding collectors willing to trade hundreds of their base cards, for other cards they were chasing. 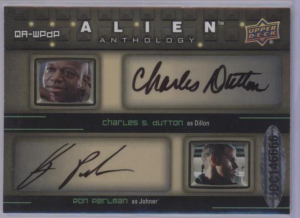 I was lucky enough to add this Quad Autograph card to my collection! Finally, Upper Deck has taken their technology another notch forward with the Quest Challenge introduced with the 2015-16 Ultimate Collection. See their website for complete details, but the bottom line is the lower serial-numbered a card is, the more “Quest” points the card is worth. And having a certain number of Quest points per subject (player) allows you to acquire Achievement cards ranging from e-Pack only Rookie cards to Connor McDavid signed Rookie cards and Autographed Rookie NHL Shield cards. With this release, I decided to forego the chase for Achievement cards, and instead, traded my high Quest point cards for cards of my personal collection. 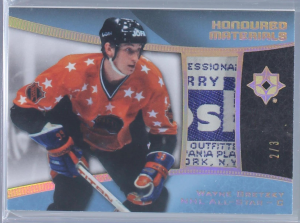 Some of my booty includes a Connor McDavid Autographed Jersey card, a Wayne Gretzky Autographed All-Star Jersey card, and a handful of key short printed rookie cards. And perhaps, this summarizes why I love e-Pack so much – you can collect in so many different ways. I support the local cards shops wholeheartedly and Upper Deck has approached a potentially sensitive issue by releasing sets on e-Pack several weeks after release allowing retailers time to sell their inventory. However, the collector experience on e-Pack has me hooked and I am excited about the calendar of releases set of e-Pack this season. The e-Pack site isn’t even a year old yet and I expect as the site features and performance grows, even more collectors will jump aboard. The potential Upper Deck has shown in leveraging the digital channel to improve the collecting experience is truly groundbreaking and I can’t wait to see what they have in store for us next! Ben has been a card collector since 1986 when the chase for Will Clark rookies was his modest collecting goal. His wife and two young children are avid Bay Area sports fans and he continues to collect all things San Jose Sharks, San Francisco Giants, and Golden State Warriors. Seek him out for trades on the Upper Deck e-Pack site via his username KNEEPAIN as he’s also been the veteran of multiple knee injuries during his weekend warrior athletic career.